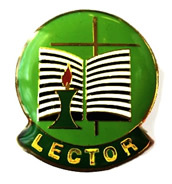 Green, the color used during Ordinary Time of the Church year, is the color of this pin. Symbols of a lector-- the bible, a candle, and a cross-- are outlined in gold. The word, "Lector" is in gold on the base.